This pop-up display design proved to be an extremely powerful solution for Sage to promote their products at a key industry exhibition. Over the years we have helped Sage on a great range of projects to meet their industry exhibition calendar dates. 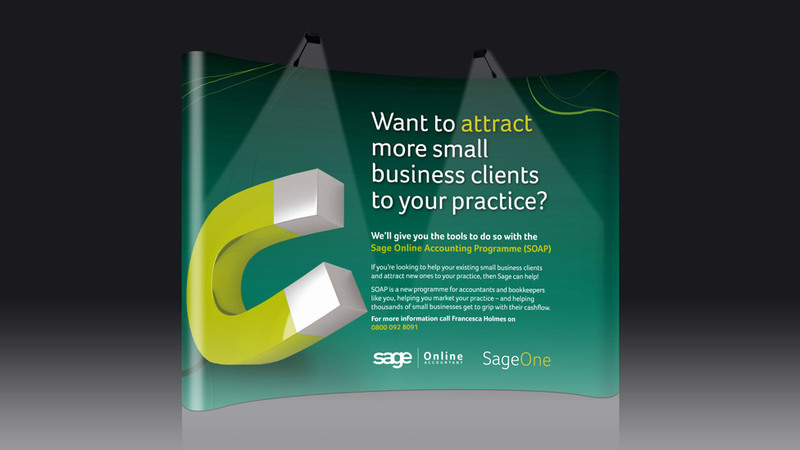 3×3m pop-up displays – such as this one for Sage – offer an area of around 2.5m x 2.2m for attracting new customers, as well as staying in touch with current ones, and it’s a fail-proof way of ensuring your audience remembers your company and the products and services you offer. Simon went above and beyond his role in so many ways. The greatest attraction of an effective pop-up display design is that the visual area is a completely blank canvas. This means we can produce creative marketing and advertising graphics without restrictions on format. Another advantage is that pop-up displays are mobile, lightweight and a cost-effective marketing solution that can be used for a wide variety of events and locations. Our graphic design team have produced pop-up display design options for Sage, as well as other clients, and have extensive experience in creating stunning visuals to make the most visual impact. You can see additional examples of our work on our pull-up banner design and modular exhibition stands pages.